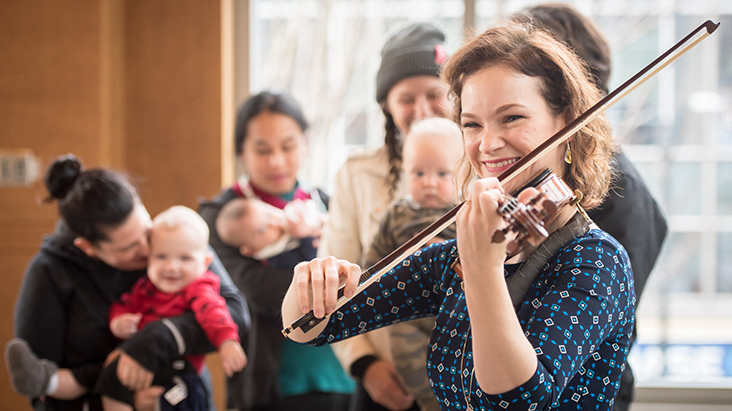 As this season’s Featured Artist, renowned violinist Hilary Hahn and the Seattle Symphony collaborated on a series of concert experiences that encouraged audience members to relax and engage with the music in their own way. How can music enrich our lives? Violinist Hilary Hahn is on a lifelong search for the answer. As the Seattle Symphony’s Featured Artist this season, Hahn pioneered a series of pop-up concerts that explored how live music can be a tool to enhance and enrich everyday experiences. Hahn appeared four times on the Benaroya Hall stage this season: first in recital in October as part of the Distinguished Artists series and then in February for three performances of Bruch’s Violin Concerto No. 1 with the Seattle Symphony. In contrast to these performances for large audiences, Hahn used her residency to connect with audience members through more intimate experiences. Her residency began with a yoga workshop at Be Luminous where she performed during a meditative session. “I was surprised by how, at certain moments in the class, it was crystal clear to me which music was called for — even pieces I hadn't thought of in advance,” says Hahn. Other highlights included a visit to the Merriman Family Young Composers Workshop and an interactive Pen and Paper concert at L.A.U.G.H. studios in partnership with The Catherine Mayer Foundation. *Editor’s Note: The Seattle Symphony provides a variety of concert experiences for children and parents, including newborns. Learn more about Tiny Tots, Sensory Friendly Concerts and our Family Concerts series. To begin her residency, Hilary Hahn met with 10 young composers in the Merriman Family Young Composers Workshop to share her unique perspective on new music. Photo by James Holt. In addition to demonstrating violin techniques for the young composers, Hahn answered questions and provided feedback on their compositions. Photo by James Holt. Parents and their babies gathered around for a special recital with Hahn that included music for parents and children alike — Bach’s Partita No. 3 and “Twinkle, Twinkle, Little Star!” Photo by Carlin Ma. No matter your age, intermission is always a great time to meet new people! Paul, Ellie, Elizabeth and Zachary play while their parents enjoy the music. Photo by Carlin Ma. Ellie reaches for the violin while her father, Anthony, talks with Hahn after the recital. Photo by Carlin Ma. Audience members were invited to sketch and draw with pencils while listening to Hahn perform at the Pen and Paper concert at L.A.U.G.H. Studios. Photo by James Holt. Two audience members join in the painting of a group mural that began with tracing Hahn and Music Director Ludovic Morlot conducting and playing violin together. Photo by James Holt. Hahn and Morlot give dancing and painting with their feet a twist! Photo by James Holt. Hilary Hahn’s 2016–2017 residency is generously supported by the Judith Fong Music Director’s Fund. The Seattle Symphony’s Family, School & Community programs are supported by 4Culture, the Ann and Gordon Getty Foundation, The Boeing Company, Citi Community Capital, The Clowes Fund, Inc., the Elizabeth McGraw Foundation, KeyBank Foundation, the League of American Orchestras, Richard and Francine Loeb, Kjristine Lund, D.V. and Ida J. McEachern Charitable Trust, the Merriman Family Fund, Music4Life, the Muckleshoot Indian Tribe, Music Works Northwest, the National Endowment for the Arts, Peach Foundation, the Peg and Rick Young Foundation, Russell Investments, Seattle Pacific University, the Seattle Office of Arts & Culture, The Sheri and Les Biller Family Foundation, Christine and Michel Suignard, Ten Grands Seattle, Tulalip Tribes Charitable Fund, the U.S. Bank Foundation, UW Autism Center, Weill Music Institute, Wells Fargo Foundation, the Wilson Sonsini Goodrich & Rosati Foundation, the Wyman Youth Trust and individual contributions to the Seattle Symphony Annual Fund.